Ferrari are to part company with another senior figure after revealing tyre chief Hirohide Hamashima is to leave at the end of the year. It is the latest development in a quite remarkable series of events this season, and comes less than a day after the departure of two other managers. The team announced on Tuesday the exits of engineering director Pat Fry and chief designer Nikolas Tombazis. Their president, two team principals and engine boss have also left in 2014. And lead driver Fernando Alonso negotiated his own exit, having lost faith the team could be competitive in the near future. The Spaniard will drive for McLaren-Honda next season. Ferrari ended the year without a race win for the first time since 1993 and finished fourth in the constructors' championship with 216 points, 485 behind champions Mercedes. 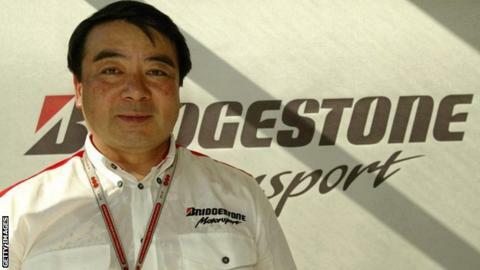 Hamashima is the ex-technical director of Formula 1's former official tyre supplier Bridgestone, which left the sport at the end of 2010. Now 62, Hamashima was instrumental in the design of the bespoke tyres Bridgestone designed for Ferrari in the early 2000s, which helped Michael Schumacher to five consecutive world titles. Hamashima joined Ferrari as head of tyre performance analysis at the start of 2012. His departure and those of Fry and Tombazis underline what has been a season of utter turmoil at the Italian team. Team principal Stefano Domenicali resigned in April, after refusing to accede to the demands of president Luca Di Montezemolo to sack engine chief Luca Marmorini. Di Montezemolo removed Marmorini anyway in the summer, and then himself left in September, replaced by Fiat chief executive officer Sergio Marchionne. Domenicali's replacement as team principal, Marco Mattiacci, was himself sacked immediately after the end of the season to be replaced by Maurizio Arrivabene, formerly of Ferrari's main sponsor, the tobacco giant Phillip Morris.